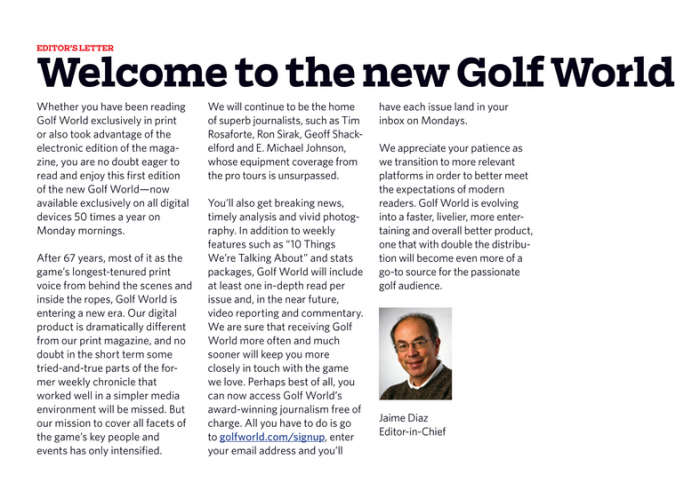 Golf World Goes Digital Only - What Does It Mean? Golf World Goes Digital Only – What Does It Mean? Golf World, has been printing for 67 years. I haven’t been a subscriber that long, but I have been a subscriber for about 15+ years. It’s always been a magazine that I’ve really looked forward to. I thought they had delivered it weekly over those years, but I guess they moved to every other week in recent years. I didn’t realize the change because for at least the last few years I’ve been a digital subscriber only. There was a time when I would get both the digital version and the print version, but I would always toss the print version in the trash right away. I never thought much about it, but thought about it recently with the news that Golf World would be going entirely digital starting this week. It’s a pretty cool move and it makes sense. I know I don’t represent all subscribers, but for me it makes sense that the magazine would move its focus entirely to digital. They’re not the first. There have been moves like this in publishing and in other print industries like catalogs for about a decade or maybe even longer. This does mean a few changes for those that create content including businesses. People don’t like change. That’s a general statement, but it seems to be pretty universal. Even when we say that we’re open to change we seem to kind of cringe at the thought. A big change like the one Golf World is making or has made will make some people angry. These are the customers that prefer the print version. They don’t use email. They don’t browse websites. They look forward to getting their regular golf news every week in the mailbox. These customers are out of luck. They’ll have to convert to email or lose their content. Or there could be another player in the golf industry that steps in to fill the void. Content channel preferences are not new. For businesses, it makes sense to stick to doing a few things well. Golf World has had a great digital version of its content for years and they decided to focus on that going forward. They’re going to lose readers, but the bet is that in the long-term they’re going to become a great digital platform, which will lead to more digital readers than they would have with the hybrid model. But demand for print won’t go away. Let’s say the common print reader is 65 years old. That’s still a lot of years of reading. A competitor that focuses on print can step in and claim those readers for the next 20+ years. And this will work out for everybody. It’s hard or even impossible for businesses to do multiple things well. Golf World is focusing on digital and that’s good. For the last few years I’ve loved the weekly Golf World Monday version of the magazine. This was optimized for online reading. Every Monday, I and other subscribers would get an email early in the morning. We’d click the link and it would open up the digitally-optimized version of the content. The entire thing fit on the screen and it was easy to read (and to watch). 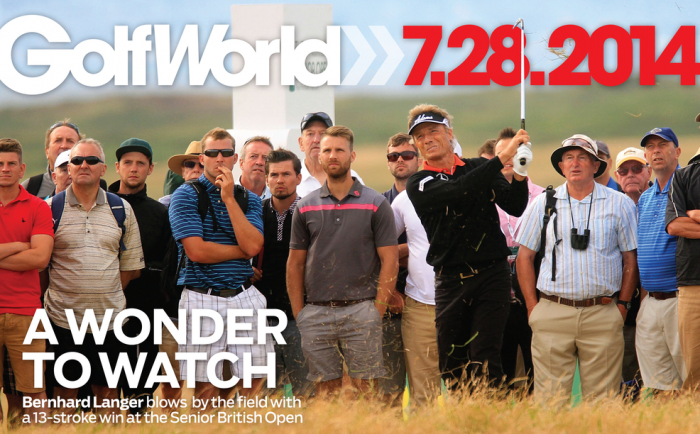 But for the last few years, Golf World has also emailed out a digital version of its print magazine. This was not a good digital experience. It was simply a scanned version of the magazine. As you know, your computer screen is likely wide while magazines are vertical. Magazine design does not work well when read on a computer. As a result, I would often read Golf World Monday while deleting the regular magazine digital version. Now I’m excited because this week’s Golf World arrived in the digital version and there is no more scanned print version. All the content from now on will be optimized for the digital experience and it will only get better. The hybrid model often doesn’t work. It at least makes it a challenge for the company to be the best at something. I like the move that Golf World is taking to become the best digital provide of golf news and insight. There are other interesting things about this change like how Golf World won’t be charging subscriptions anymore. It’s all advertising based now, which is another good change. One or the other is good with digital. A hybrid model doesn’t seem to work. But this has an impact on businesses that are producing content. Look at who your customer is. If they’re more old school and someone that likes getting a printed version of content then maybe your focus should remain there for things like your business newsletter and things like regular reports and other correspondence. If that’s the case then it makes sense to put all your effort there instead of working toward a hybrid model. And the same is true if you feel that your customer today (or in the near future) prefers digital. You owe it to them to be the best at providing digital content that you can be. This means focusing on email content, blog content and other online channels. There are also tons of things you could do with online content. Don’t try to do them all. At GBW, we focus on blogging and it seems to work for our readers. We do email and we do 2 social media channels. If you do too many you’ll spread yourself too thin. Identify your customer’s (and your) preferred channel and focus on that. Become the best at it. Don’t do hybrid models. Follow the lead of Golf World and others. They’ve been around for 67 years and they’ll be around for a lot longer. They know what they’re doing.